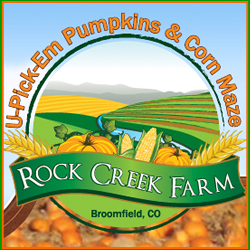 Rock Creek Farm is the perfect destination for that family weekend outing in the wonderful Colorado fall harvest time. This pumpkin patch farm is one of the more popular destinations north of the Denver metro area and is a local landmark for fall fun! Perfect for groups and birthdays, have a blast at the U-Pick-Em Pumpkin Patch, try the corn maze, ride a hay ride, visit the farm animals and family fun area and more!